We’d love your help. Let us know what’s wrong with this preview of Wain by Rachel Plummer. To ask other readers questions about Wain, please sign up. Full disclosure: I'm the editor of this. But also it's amazing and everybody should read it. I read this book slowly, to savour it - a poem before bed. It was gorgeous and loving to read, and it makes me so happy to think of the young ones who will hear these stories, and see themselves in them for the first time. Selkie still brings tears to my eyes, many readings later. I am hopelessly in love with this book. What's not to love about old Scottish tales and legends re-told in beautiful poetry, re-imagined with all kinds of LGBT+ representation, and presented in a volume full of gorgeous, colorful illustrations? As a storyteller, I could see from every poem how intimately the poet knows the traditional stories, and how carefully she treats them and retells them in a way that they say something to young people in our age, but still retain their magic and their sym I am hopelessly in love with this book. 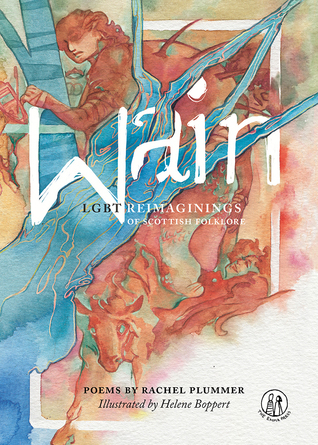 What's not to love about old Scottish tales and legends re-told in beautiful poetry, re-imagined with all kinds of LGBT+ representation, and presented in a volume full of gorgeous, colorful illustrations? As a storyteller, I could see from every poem how intimately the poet knows the traditional stories, and how carefully she treats them and retells them in a way that they say something to young people in our age, but still retain their magic and their symbolism. Each poem is more beautiful than the other, and several of them made me laugh out or shed some tears. The illustrations are equally detailed and full of meaning, and often they add a lot to the words. The book is enchanting, and I keep going back to re-read it over and over. I first heard about poet Rachel Plummer's new collection of LGBT-themed reimaginings of Scottish folklore, Wain, last autumn, when the anti-trans brigade on social media started whipping up a frenzy of protest about the first poem published on Twitter as a teaser, 'Selkie', which uses the idea of the skin-changing selkie to explore transness, removing one skin to reveal the hidden self inside. I loved the poem, and when the publishers set up a scheme to allow people to buy a copy for themselves I first heard about poet Rachel Plummer's new collection of LGBT-themed reimaginings of Scottish folklore, Wain, last autumn, when the anti-trans brigade on social media started whipping up a frenzy of protest about the first poem published on Twitter as a teaser, 'Selkie', which uses the idea of the skin-changing selkie to explore transness, removing one skin to reveal the hidden self inside. I loved the poem, and when the publishers set up a scheme to allow people to buy a copy for themselves and a second, discounted copy to donate to a school, I took advantage of it to pre-order the book. the hill that was our home. A phenomenal collection by a super talented poet. 4.25/5 🌟 such a beautiful collection. 💓 Thank you so much to the publishers for sending me a review copy. The poems and illustrations are just gorgeous. Honestly so happy to have this collection.I really enjoyed learning about all the Scottish folk tales and I loved the diversity of this book. I would definitely recommend this book to others.